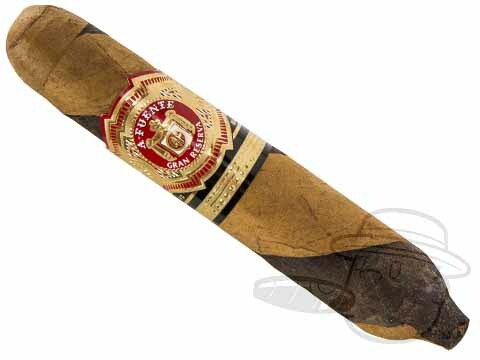 Quite possibly the most popular figurado cigar line in the world, the Arturo Fuente Hemingway was the Fuente Family's original small batch cigar. Featuring some of the most masterful construction found in any premium cigar, the Hemingway is comprised of the company's finest Dominican binder and filler tobaccos beneath a creamy Cameroon wrapper. This extraordinary combination produces smooth, earthy flavors with a spicy finish and amazing woody aroma that has captivated the palates of discerning smokers for decades. For uncompromising high quality and remarkably rich character, simply put, the Arturo Fuente Hemingway is in a league of its own. I do not love all Fuente sticks. However, I have never had a Hemingway that was less than perfect. From the Short Story on up they are wonderful cigars. I visited the Fuente factory in the DR, and was in the Hemingway aging room with 750,000 sticks. Probably as close to heaven as I'll ever get. This stick, the Between the Lines is probably the best of the Hemingway line. The flavor and aroma profile could define the word umami. The construction and burn are perfect. It is a pricey stick, but in this case, worth the cost! Good Fuente short smoke. Nice flavor and a good burn. Draw could be a bit better though. Over all really good. Arturo Fuente Hemingway Between The Lines is rated 4.5 out of 5 based on 3 customer ratings.